Travelers Rest Lodge hosts two deluxe cabins that sleep four. Click on the cabin name below to view availability and photos. 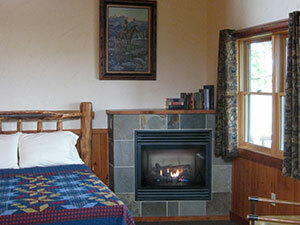 Gunsight Pass May 1 - June 15 and Sept. 16 - Sept. 30: $149 per night plus tax. June 16 - Sept. 15: One night $169 per night plus tax. Two or more nights $160 plus tax. Triple Divide May 1 - June 15 and Sept. 16 - Sept. 30: $149 per night plus tax. June 16 - Sept. 15: One night $169 per night plus tax. Two or more nights $160 plus tax. Deluxe Cabins have two Queen beds, full bath, kitchenette with dishes, silverware, toaster, microwave, under-the-counter fridge, full size coffee pot with coffee and tea provided, dining area with table and chairs. Cabins also have gas-log fireplaces and covered porches with comfortable seating.